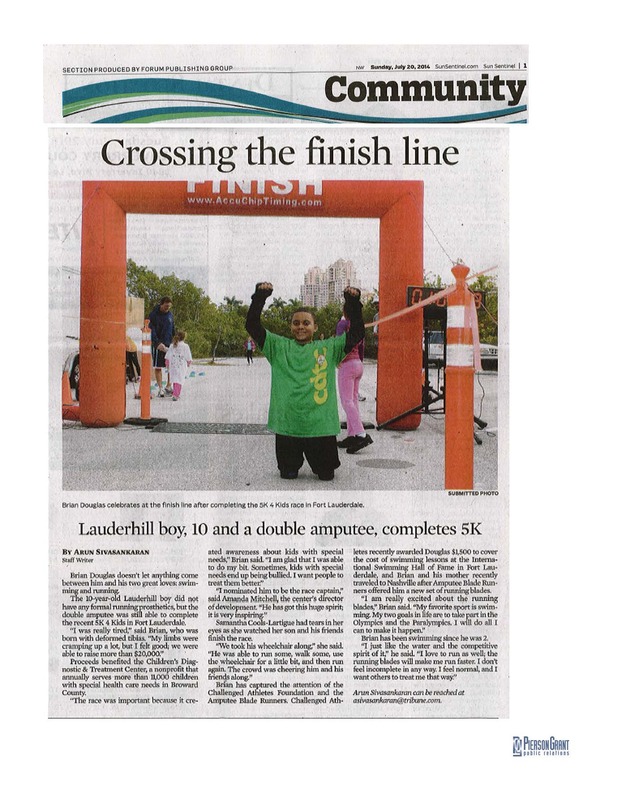 Sun Sentinel, February 3, 2015, “Helping Children in Need” Dozens of local runners recently turned out for the fourth annual 5K 4 Kids, benefiting the Children’s Diagnostic & Treatment Center. Sun Sentinel, August 3, 2014, “Gift of legs sets young amputee on new path” He may lack legs, but Brian Douglas is fleet of foot. And now he’ll be sprinting at an even faster pace. Miami Herald, May 25, 2014, “Challenged Runner Honored” A reception at Stout Bar & Grill honored double amputee Brian Douglas for serving as the race captain at annual 5K 4 Kids. Westside Gazette, May 8, 2014, 5K 4 Kids CDTC patient, 10 year old Brian Douglas inspired a crowd at 5K 4 Kids race. Sun-Sentinel, January 25, 2014, “10 year old double amputee runs in 5K 4 Kids Race” Brian Douglas sprinted across the finish line of his first 5K Saturday despite aching shoulders and legs. The 10-year-old double amputee from Lauderhill was one of 300 runners to participate in the third annual 5K 4 Kids race hosted by the local Saint Anthony Knights of Columbus.